This was the side dish that accompanied the flavorful ribeyes at the party I cooked for last weekend. It was a big hit. Be sure to adjust the amounts of spiciness and sweetness to match your taste. The cooking instructions for this dish are timed so that the mushrooms are started, then heated in an over while steaks are grilled. Then, while steaks are resting, the mushrooms are finished. 2 large shallots, sliced; or ¼ cup onion, diced. Saute pancetta over medium high heat for 4 minutes, in an oven proof skillet. Add butter, oil and shallots and cook for 1 minute. Add white or brown mushrooms and season with salt, pepper and red pepper flakes to taste. Cook for 5 minutes. Mushrooms will not be fully cooked. Put skillet into oven for up to 20 minutes, while steaks cook. When steaks are cooked and resting, remove skillet and return to stove. Add chicken stock and turn heat to high. When most of the stock is reduced, but pan still has some liquid, remove from heat and add lime juice and syrup. Check seasoning and add S & P if desired. What Did You Put on the Steak? Last weekend I cooked for a party of friends, sharing some of my favorite dishes. There were two appetizers, a soup, and three entrées, each with a separate side dish to pair with it. Since some of the dishes had multiple parts, there was actually a total of fifteen separate components to prepare and cook. There are few things more enjoyable to me than preparing this kind of meal. Let me admit up front that there was a little bragging going on in that last paragraph, and it has little to do with how we cook on a typical busy weeknight. But one comment from the dinner party stood out, which became the impetus for this week’s home cooking discussion. “What did you put on the steak?" asked Sherry emphatically, with a broad smile of satisfaction on her face. Of course we went on to discuss why her steaks and mine didn’t taste the same. I realized that there were three or four reasons why the steak last weekend was so good. I’ll share. .
Lots of Salt. I salt the steaks before grilling with Kosher salt, and use a lot more than most people would be willing to put on their steak. My estimate is about 3 tablespoons, maybe a little more, for 3 one-pound steaks. I also top with a few twists of fresh ground pepper. Very Thick Steaks. The steaks last week were Ribeyes, and they were cut at least an inch and a quarter thick. Between 1-¼” and 1-1/2” thick is a good size. It’s much harder to overcook a thick steak. High Quality Steak. These Ribeyes were from Central Market, a gourmet grocery with a meat counter equivalent to a stand alone butcher shop. Also, Ribeye itself is quite flavorful, as it has quite a bit of marbling (fat). Cook to Correct Temperature. 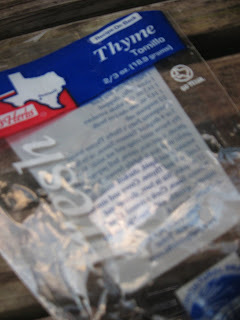 Lately, I’ve been using an electronic instant read thermometer to test how cooked my meats are. These steaks were cooked to 125 degrees, and then after sitting for 10 minutes (another important step), probably ended up being cooked to 130-135 degrees – perfect medium rare. In hindsight, I’m trying to remember if I drizzled a little olive oil on the steaks before they were cooked. I probably did, but not too much. The oil serves to keep the steak from sticking, more so than to add flavor. So maybe, OK, probably, there were three things on the delicious steaks. This little discussion about simple steaks continues to reinforce a couple of my main themes about home cooking. The original version of this recipe appeared in Cooking Light magazine. As I mentioned in my last post, few of CL's recipes are really very well composed. It seems like there's a significant problem in recipe composition or instructions in most of their recipes. Take this recipe, for example. Besides the ingredients you'll see in my version of the recipe, they called for 3 1/2 cups of sliced radicchio. Radicchio is that vegetable that looks like purple cabbage, but is smaller and has a different taste. The bright, almost spicy taste of radicchio is what adds a little jolt of flavor to a sophisticated salad, much like arugula can do. But 3 1/2 cups of raw radicchio for one pound of pasta is insane. Even if you're a radicchio lover, which not everyone is, that's an enormous mound of raw vegetable, even if it wilts a bit when added to hot pasta. Further, the picture published with the recipe doesn't begin to show that amount - just a few tasteful strands. So what's going on with this Cooking Light disaster? Is there a typo - did they mean 2/3 cup instead of 3 and 1/2? Did they intend that 3 cups gets cooked down with the caramelized onions, than 1/2 cup raw is added to finish? We'll never know. But this is a great example of a recipe that looks good initially, but contains fatal (OK not fatal, just glaring) errors. Heat oil and butter in a large skillet or dutch oven over medium-high heat. Cook onion for 15 minutes, then lower heat to medium-low and cook another 20 minutes or more until onions are a deep golden brown. Season lightly with salt twice during while cooking the onion. Add garlic and red pepper flakes to taste (no more than 1 teaspoon). Add pepper strips or radicchio is using. Cook 3 minutes. Add wine and cook until liquid is absorbed. While onions are browning, cook pasta and drain, reserving about 1/2 cup of cooking liquid. Toss pasta, onion mixture, oregano with a generous amount of kosher salt and fresh ground pepper. Mix in reserved cooking liquid to create a little bit of sauce consistency. Serve with grated Parmigiano. 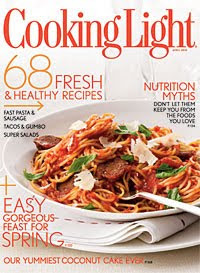 "68 Fresh and Healthy Recipes"
"Easy Gorgeous Feast For Spring"
"Our Yummiest Coconut Cake Ever"
These headlines are from the cover of this month's issue of Cooking Light - a true smorgasbord of teasers and come-ons. Tacos and Gumbo? At the same meal? I hope not. How about Coconut cake for dessert after your tacos and gumbo? I've had a number of people tell me how frustrated they get when they page through a cooking magazine. It may be that everything looks so good they have a hard time deciding which dish to cook. Or, as they scan so many recipes they're just not sure which ones would turn out well for them. Or which are too hard or too slow to make. Whatever the case, they're telling me that they get information overload. 68 recipes (more than 2 per day) sounds like overload to me. Cooking Light is the most successful cooking magazine on the market today, as it draws in more advertising pages than any other title - by far. Cooking Light isn't the kind of resource I've relied on for recipes or ideas, but since it is read by so many people, I subscribed and then made a few dozen of their recipes over the past 6 months. Published recipes have confusing instructions **, have mistakes, or typos. "Certified" or "Test Kitchen Guaranteed" recipes can still be "just OK".....or worse. Stated cooking times are usually off by a lot (and I'm really fast and organized in the kitchen). It's really hard to tell which recipes are going to be good and which not so good. Overall, I'm not too impressed with Cooking Light. The recipes variously call for expensive convenience ingredients such as pre-chopped garlic or grape tomatoes, yet will sometimes specify complicated or unnecessary steps to perform, thus losing time. I also think Cooking Light recipes generally call for too many ingredients. Why is that? I think they are kind of "throwing the kitchen sink" at the dish to drive out flavors. Yet, I've found most of their end results to be pretty bland. Frankly, the recipes just aren't that good. Put mainstream media in perspective. They are trying to attract as many people as possible, and I believe they sacrifice food and recipe quality to achieve that goal. Don't forget, they're really in the business of selling ads. Rely on a few high quality recipe sources, such as highly recommended cookbooks such as How to Cook Everything. One of the best magazines out there is Cooks Illustrated. There is no advertising, it's an attractive presentation, and they do very thorough analysis and testing to create really flavorful dishes. Yet nothing is all too fancy. They're really focused on good tastes. Don't forget that the shortfalls in Cooking Light apply to random Internet searches for recipes too. Just because something sounds good, doesn't mean it's a good recipe / version of that dish. Of course, I'm not saying all the recipes are bad. However, I don't think I made a single one that didn't require some sort of modification. I'm not suggesting modifications "....to suit my taste....", but rather modifications to keep it from being a fairly disastrous or inefficient or overly costly recipe. So this week I share a recipe from November's Cooking Light with you, with one simple modification: Pasta with Carmelized Onions. See it in the next post. "Add onion. Saute 15 minutes or until almost tender. Reduce heat to medium low; cook until deep golden (about 20 minutes)." Does that mean 15 minutes, plus another 20? Or does it mean 15 minutes, plus five more to total 20 minutes. Maybe because the 20 minute instruction is in parenthesis, it's throwing me. If it weren't, I'd clearly treat it as an additional 20 minutes, because it would be presented in a similar manner to the first timing instruction. I'm not trying to be too picky - but for a cook without a lot of confidence and experience in the kitchen, would he/she really know what to do? Do you? BTW - the correct approach is 15+20. Carmelizing onions for a little over 30 minutes is the best way to get delicious, sweet flavor from them. They're awesome. There's absolutely nothing special to this recipe - except the incredible end result. 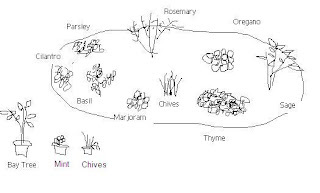 I'm specifying a typical mixture of herbs, but you can use any combination that is to your taste. Since thyme is a little stronger by volume than tarragon and mint, the quantity is less. That's not a bad general rule - the smaller the leaf of an herb, the less quantity you should use compared to other herbs. Notice that I don't use garlic in this recipe - I didn't want it to compete with the herbs for attention. Drain pasta and add remaining ingredients and plenty of salt and pepper. You may say to yourself, "Of course that's true. I use fresh herbs whenever I cook nice or fancy." Or this might be news to you. Either way, you could also argue that fresh herbs are expensive and don't last long. Usually you only need a few sprigs and the rest goes to waste. So it's really just a way of buying yourself into being a better cook. Yet, a plant like this costs $2.49 at a comprehensive garden center (read: not Lowes), and will last months, even if you don't replant it. Using fresh herbs where dried are specified is typically done by increasing teaspoon quantities to tablespoon quantities. There is not really a known exception where dried herbs are better than fresh. Dried herbs are often on supermarket shelves or in warehouses for YEARS. Since they are a necessary backup to fresh herbs, buy brands that have a production date or have the most color and character. Morton & Bassett makes high quality dried herbs. Buy potted herbs at a garden center - even if you only use them for cooking and never plant them. The small container plant will stay alive in your kitchen, or on your back porch, for months. And it will KEEP GROWING, funny how they do that. This way you won't continually replace expensive store bought herbs. Grow herbs in pots - most do well indoors. They just want light and a little (not much) water. Plant an herb garden. 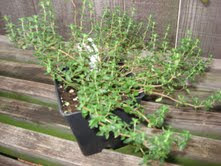 In the south, rosemary, oregano, thyme, sage, marjoram all survive the winter. Chives, parsley, mint and cilantro do well in pots all year. Some annuals (cilantro) need to avoid the extreme southern heat, but are ideal in a garden in the north. Basil does well everywhere in the warm seasons. A Bay tree (starts as a twig) in an attractive pot can be taken in during a northern winter. I haven't bought bay leaves for 10 years now. Herb gardens need little water as most herbs thrive in dry soil, so it's a very simple gardening proposition. I promised you a shortcut, and now it sounds like you have to plant a garden. Not really. You can simply grab a package of fresh herbs from the store, or pick up a simple plant and use it tonight in the kitchen. One of the best ways to use fresh herbs is on pasta. A mix of two or three finely chopped herbs, along with some olive oil, parmesan and S&P makes a surprisingly sophisticated dish, with lots of flavor. Last night I used thyme, tarragon and mint. It was delicious. This recipe actually comes from a regional Chinese cookbook. It's got pleasant, subtle flavor, you can cook the cauliflower to as firm or soft consistency as you care to, and it's quite quick and easy. Heat the bacon in a large skillet over medium heat. If you wish, you can cover the pan, though the bacon will not get crispy. That's OK for this recipe, unless you truly prefer crisp. Cook the bacon for 7-8 minutes, then pour off all but 2 tablespoons of the bacon fat. Alternately, cook the bacon in a 400 degree oven for 10-15 minutes until crispy. Pour about 2 tablespoons of the bacon fat into the skillet and add the crispy bacon at step 5. Turn the heat up to high, then add the garlic slices and cook for 30 seconds. Add the cauliflower and stir to coat, about 1 minute. Lower the heat to medium and add the chicken stock. Cover and cook for 5-6 minute, or until caulifower texture is to your liking. Season with S & P.
As a balance to bacon, which most of you will consider not the healthiest thing to munch on, I'm adding some information about cauliflower. Cauliflower gets no respect. Yet it's highly nutritious, being low in fat, high in fiber and includes an excellent profile of vitamins, especially vitamin C. It also is purported to have benefical effects in prevention of breast and prostate cancers (Carcinogins at Oxford Journal, 2006), as well as reduction of active tumors from these cancers. 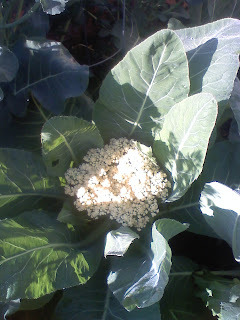 Compared to most vegetables, cauliflower has a more delicate and less harsh aroma and taste, so I'm surprised that more parents don't try to leverage it into the vegetable battles we all face. It's not really my preference, but there are orange, green and purple varieties of cauliflower. The colored caulies might make converts or some of the school aged crowd. Maybe there just aren't enough good recipes. Last week I gave you a simple roasted vegetable recipe that can be used with cauliflower, so this week I'll give you one for stovetop - that adds in our feature ingredient - bacon. See the next post for the recipe. This week I'm pleased to introduce a guest columnist who will share her thoughts about.....bacon. Rebecca VanDolzer is a student in the restaurant and hospitality program at the Conrad Hilton college at the Univeristy of Houston. She's an avid and accomplished home cook, and since she's from, let's call it "a different generation" than I am, she'll add new perspective when she shares her thoughts with us. Welcome Rebecca. Most people would agree that bacon is held in pretty high regard here in the United States. Not only is bacon a part of the classic American breakfast, there is currently an emerging "pork cult", so to speak, sweeping the nation. 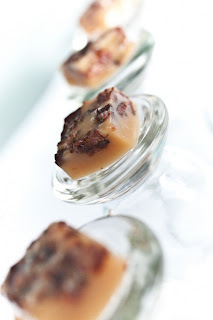 Chocolate covered bacon is sold in high end sweet shops and bacon has been added to cocktails by infusing it into spirits. Bacon blogs abound. One of the best is The Royal Bacon Society. There are even restaurants completely dedicated to the love of pork, lead by chefs sporting pig tattoos (men and women, including a trio in Houston who run the restaurant Feast). The high-falutin’ pork trends sound intriguing, but I’m partial to a good, old-fashioned piece of perfectly crispy bacon. Despite having tried the best parts of pork, prepared by techniques from all over the world, nothing can beat the wonderful simplicity of my old friend bacon. I know that cooking bacon is a simple concept in theory. Fry it up in a skillet until it's golden brown and you have yourself a treat. But ooooohh, what a mess!! 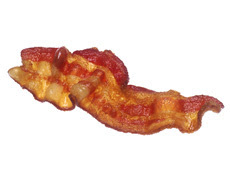 By the time you are done frying bacon there is grease build-up all over your stove and even on the counters and walls. How does it get on the walls? Not to mention the battle scars that the hot grease leaves as it jumps out of the pan onto your arms. Don’t cook bacon in shorts – trust me. Is it really worth it? I can't tell you how many times I have struggled with this bacon battle. Countless band-aids and grease soaked towels later, I decided to fight back. I even eventually won the war. I thought to myself, there has to be an easier way to enjoy this delicious piece of meat without all the work and pain. Ah ha! Just two things are needed. A rimmed sheet pan and the oven. The perfect idea! I placed the bacon strips on the sheet pan, cranked the oven up to 400 degrees and waited. It seemed simple enough, and it actually worked like a charm. No more mess and no more pain. It only took 10-15 minutes for perfectly crisp bacon. Then you can just rinse off the pan and throw it into the dishwasher. Amazing! This approach even works if you prefer your bacon on the limp side. Just leave it in for a little less time and you have yourself a nice flexible form of the beloved meat. Now even the most impulsive cravings for this salty piece of pork can be satisfied with ease. If your bacon doesn’t need to be too crispy, you can cook it in a skillet with a cover. Since the steam doesn’t rise and evaporate, it won’t get crisp. In Tom’s recipe for Cauliflower with Bacon, this technique is used. In the category of kitchen gadgets, there is a tool called a bacon press. It’s a heavy cast iron plate with a handle atop. The press is placed over the bacon while it cooks. Some grease will splatter, but not nearly as much. And the bacon is cooked in a near perfectly flat configuration. I was given one as a gift and use it occasionally, but in the end recommend the oven fry method above all. "I had rather be shut up in a very modest cottage with my books, my family and a few old friends, dining on simple bacon, and letting the world roll on as it liked, than to occupy the most splendid post, which any human power can give."